Tone 8 begins a Spiritual Transformation. Number 8 is the symbol of Infinity. 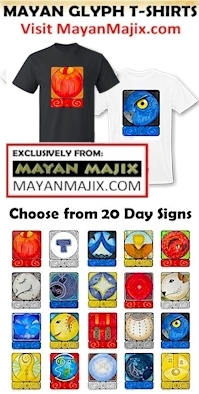 WAXAJQIB (washa-keeb) in the Mayan Number 8 that represents the “Solar Number of Pure Spirit.” Through a Divine Transformation, Tone 8 offers the Ethereal Substance of Light Above to Create Life, Love, and Happiness. In this round of the Tzolk’in 8 Sun/AHAU heralds the Sign of Human’s New Spring. At the altar of the Reed/BEN trecena, a Light will shine right above the Channels of Light to pour down a direct Blessing of Illumination. The Light we are given is Sun/AHAU. AHAU is our Direct Source of Light, the Supreme Lord of The Creation. AHAU spoke the world by Dreaming it and Saying it was So. On AHAU we are all reconnected through One Light. AHAU is the Sign that we are connected Here and Now in the presence of the Old Ones, the Ascended Masters, and all the Divine Spirits that, like us, were Human, and chose the Mission of Extending the Love from Above to Below. Today we Honor the Whole. MASTER NUMBER 88: Today, the 8th of February and the Tone 8 illustrate the Master Number 88. Two 8s magnify and double the Abundance and Infinity of the Number 8. Master Number 88 holds the Divinity as a Sign of the Universal Spiritual Law of Cause and Effect. This is a Day of Spiritual Karma.